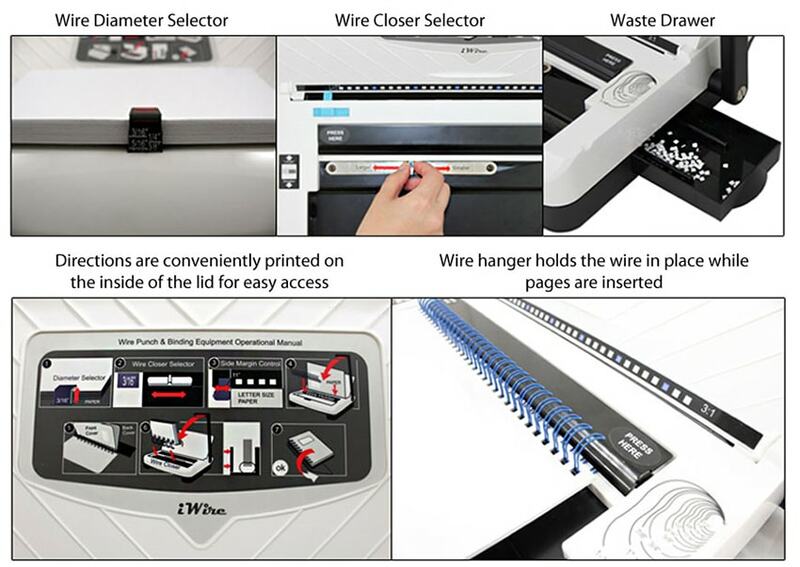 The Akiles iWire Wire Binding Machine is perfect for low to mid volume wire binding needs. The individually cast-hardened and heat-treated steel punching dies ensure many years of trouble-free operation and easy punching. The simple 2-step setup & 10-sheet single punch capacity* makes your binding job quick and easy. Vertical punching offers easy alignment of sheets for reduced punching errors while the anti-dust cover keeps the interior of the iWire clean and dust-free when not in use. The Akiles iWire Binding Machine features a built-in wire diameter and wire size guides to help you determine the correct wire-o binding spine size to be used for any given book thickness. 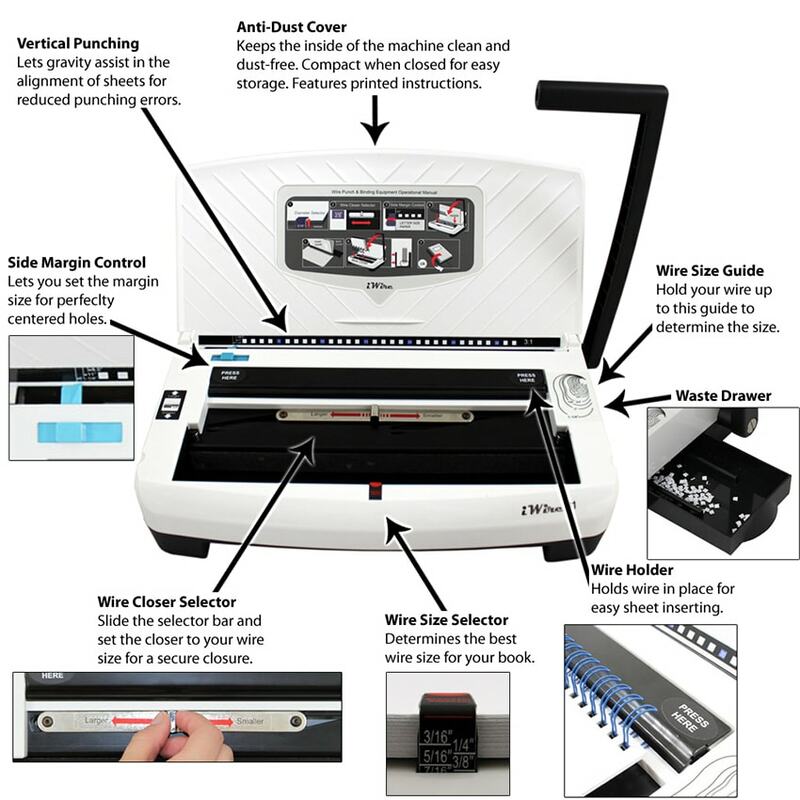 Simply place your book into the clip on the front of the machine to see what wire diameter is needed for your book. You can also double check the size of wire that you have by simple placing it on the wire size guide on the right of the machine; the image that your wire lines up with will tell you the diameter you are holding. The wire closer selector lets you adjust the wire closer to match your specific wire size, ensuring a perfect close every time, while the side margin control guarantees a well-centered punch. The Akiles iWire Wire Binding Machine is available in two versions: iWire 31, which is a 3:1 pitch machine that has the capability to bind up to 9/16", and the iWire 21, which is a 2:1 pitch machine that has the capability to bind up to 1-1/4" Wire-O. Both models feature an ergonomic and comfortable handle for smooth and effortless punching and wire closing. A unique feature of the iWire is that they have a wire hanger/holder. This clip holds your wire in place so you can hang the paper on it as you punch. This feature makes inserting the wire very easy, even for large books. The iWire Binding Machines are also very stylish and compact! They will fit easily into any home, or office environment in regards to their look and size. • The iWire is lightweight (only about 20lbs) and can easily be transported throughout the office for multiple users. • The iWire Machine does not feature disengageable punching pins or an open punching throat, so you are limited to an 8.5” x 11” sheet size for all documents. • While the machine is small and compact, the handle is always in an upright position. Ideally, the handle would be able to clip down to reduce the height of the machine during storage; however, this is not the case for the iWire. * The manufacturer specifies that the punching capacity is a full 15 sheets of standard 20# bond paper, however, rigorous testing has helped us determine that a more realistic capacity for the average user is 10 sheets of 20# paper.